When you have a World Cup record like Ireland's, there is an understandable reflex to back away from the hype machine when it cranks up. Perhaps only success at the tournament can wash away the bad memories. Until then, there will be a reluctance in some quarters to embrace the growing reality that this team is the best in the world right now and are justifiable contenders for next year's World Cup. Maybe the experience of 2007 burnt us all so much that we now retreat from the flames automatically. Talent-wise, the team that went to France 11 years ago was up there with the side that beat the All Blacks last weekend. Many would argue that it was better on paper. They beat South Africa and Australia in 2006 and come within a hair's breadth of winning the Six Nations. The available evidence pointed to a successful tournament and Brian O'Driscoll, reflecting the mood of a bullish, Celtic Tiger nation, told the world that the team was travelling with the intention of securing the William Webb Ellis Cup. Jordan Larmour was 10 when the so-called 'Golden Generation' went crashing out of that competition at the pool stages with only narrow wins over Namibia and Georgia to show for their efforts. Earlier this month, having scored a hat-trick against Italy in Chicago, the Leinster flier was asked about his ambitions for the team. "Long-term, we want to be World Cup champions," he said. "But there is a good bit of rugby to be played. There are three more huge games coming up this month. But the sky is the limit for this team. "Looking to the All Blacks, no one is scared of them, no one is afraid of them. They are a quality team. So are we. We just need to turn up on the day and we can turn them over." In olden times, that would be cut-out-and-keep dressing-room wall material but the 21-year-old's words have been backed up. 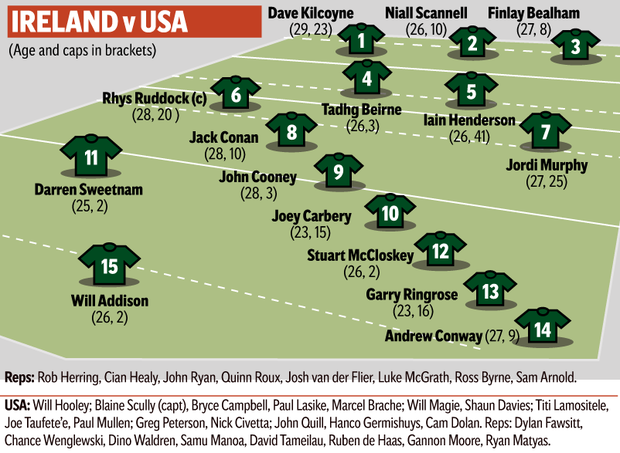 Last weekend, Ireland beat New Zealand 16-9 and should have won by more. Victory over the United States would ensure that they finish 2018 with 11 wins from 12 Test matches. Since losing to Scotland and Wales away during the 2017 Six Nations, they have beaten every one of the contenders for next year's World Cup with a record of 17 wins in 18 matches. Some will dismiss last week's game as a 'friendly', parroting Agustin Pichot's line as he tries to bring about the end of the one-off Test match and introduce a League of Nations-style competition that nobody is getting excited about. Unlike football, rugby has largely managed to resist the dreaded friendly nature of one-off games. Nobody who watched last week's match could deny its bona fides as a competitive clash. It was a low-scoring epic between the two best teams in the world and by winning it Ireland simply continued an impressive formline. It is no guarantee of success next year, particularly given the likely quarter-final meeting with a South African team coached by a pair of canny operators with intimate knowledge of the Irish system. Much can change between now and Japan; but unlike previous iterations it is clear that Schmidt and David Nucifora have learnt from their 2015 shortcomings and applied the lessons practically. Whether it was moving Ruan Pienaar on from Ulster or resisting Munster's moves for Stephen Moore, encouraging players to leave their home provinces in search of opportunity, using Test matches to give opportunities to new players, hiring Andy Farrell or fast-tracking the 2016 U-20s generation - the greater goal of World Cup success has been in mind. Behind the scenes, Schmidt has been cultivating a winning mentality. Earlier this week, Jack Conan let slip that the team met during the Six Nations to discuss their goal of being the best team in the world. They backed up their talk with actions during the Grand Slam campaign; proving their mettle in Paris and their class in London. They continued in the same vein in Australia and then made history against New Zealand. The body of work stands up to scrutiny. There are always risks. 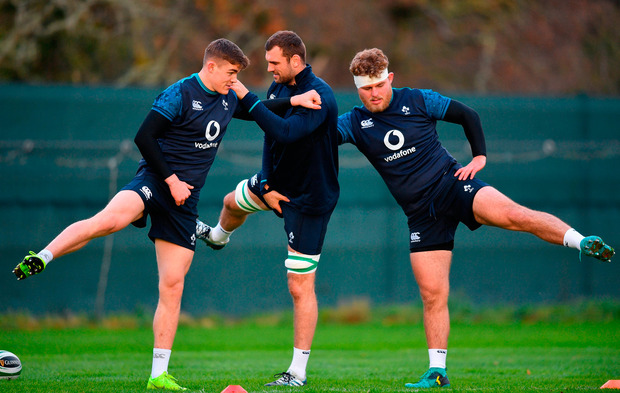 A poor Six Nations could undermine the sky-high confidence the squad is currently enjoying; injuries to key men remain a concern even if the depth levels are excellent and the age profile of the captain is a worry. But Schmidt's rigorous attention to detail puts minds at ease. His record speaks for itself and he is sure to adapt his own intensity around the long, drawn-out World Cup structure in a far and distant land. Traditionally uncomfortable with expectation, Ireland choose to ignore the outside world and set their own standards. It has held them in good stead so far and it sets them up for a tilt at the world title next season. Some would worry that it's a fall they're being set up for, but while acknowledging past failures is important, there is no reason to think that they will be repeated by this team. As they prepare to close out 2018 against the US Eagles tomorrow, they can justifiably look forward to next year's World Cup with relish. And their fans are right to be excited.